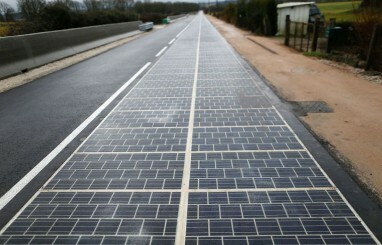 The world's first solar highway has been opened in France, in the not-very-sunny village of Tourouvre au Perche in Normandy. The roadway is just one kilometer (0.6mi) long, but that still works out at 2,800 square meters of photovoltaic cells—enough, hopefully, to power the village's street lights. The road was built by Colas, a large Anglo-French construction company. Colas has apparently been working on its own solar road tech, called Wattway, for at least five years. Wattway has been tested in car parks, but this is the first time it has been used on an active road. There will now be a two-year test period, to see if Wattway can withstand the rigour of being pounded by thousands of cars and trucks per day, and whether it can actually provide a useful amount of electricity. Usefulness aside, the main problem with constructing solar roads is their crippling cost. One of the main selling points of Wattway, according to Colas, is that each panel is just a few millimeters thick, and can thus be installed on top of an existing road, which in turn massively reduces construction costs. Having said that, the 1km road in Normandy cost €5 million (£4.3m) to build. And that's for a single lane of a two-lane highway! Expanding that out to 10m per kilometer for a two-lane solar road, you're looking at a total cost measured in billions or even trillions of pounds to cover a sizeable portion of a country's roads with solar panels. Fortunately, Ségolène Royal, France's ecology minister, has a much more reasonable goal in mind: she would like to see solar roadways replace one kilometer of every 1000 in France. Again, assuming she means two-lane solar roads at around €10 million per kilometer, the total cost would be €10 billion—not bad, assuming the panels (and the accompany electrical system) don't need regular maintenance, and that they produce enough electricity to be worth the much higher initial outlay. Indeed, their questionable efficiency is one of the main reasons that more solar roads aren't currently being built. Colas says that Wattway's photovoltaic efficiency is 15 percent, which is pretty good. But that doesn't take into account the fact that the solar panels are flat on the ground, rather than angled towards the sun's trajectory, significantly reducing efficiency at higher latitudes. Heavy traffic could also block sunlight; as could snow, mud, and perhaps standing water too after rain. Obviously the maths are a bit better on the €5 million road in Normandy, but that's still an awful lot of money to spend on powering the village's (population ~3,300) street lights. The Wattway brochure suggests that 2,800 square meters of solar roadway ought to be able to power about 140 homes—about 420MWh per year. Though clearly, if they are just looking to power the village's street lights, they're not expecting anywhere near 420MWh in reality—perhaps due to the low amount of direct sunlight in Normandy.